The Kings’s Theatre in Glasgow is undoubtedly one of the most significant theatres in Scotland and since September 2002, The Ambassador Theatre Group took over this former municipal theatre, previously owned by Glasgow City Council. The Theatre opened its doors to the public in 1904 and was designed by one of the UK’s leading theatre architects of the time, Frank Matcham. The King’s has played host to a series of top performers and stage productions ever since and is home to arguably the best Christmas pantomimes in the UK which has featured Scotland’s great comedians from Rikki Fulton, Jack Milroy, to Stanley Baxter and Jimmy Logan and in more recent days, Elaine C Smith, Andy Gray and Gerard Kelly are pantomime regulars at the King’s Theatre in Charing Cross. The King’s is a high profile venue for flourishing amateur dramatics groups who regularly showcase their productions throughout the year. In 1990, the opening ceremony of Glasgow’s European City of Culture was held at the King’s, featuring an array of fanfare and musical and stage performances with a Glasgow theme to mark the special occasion. The theatre is proud to incorporate a variety of artistic genres in its programme of event and now features more classical plays and dramas, comedy and choreography alongside its traditional pantomime and leading musical performances. The King’s Theatre in Glasgow is proud to offer a rich diversity of educational activities and workshops, mainly organised throughout the summer season. They introduce a variety of skills including drama, dance, music, lighting and management to both adults and children. All levels of experience are catered for and if you want to be on stage to hone your skills, why not attend one of the various programmes at the King’s. 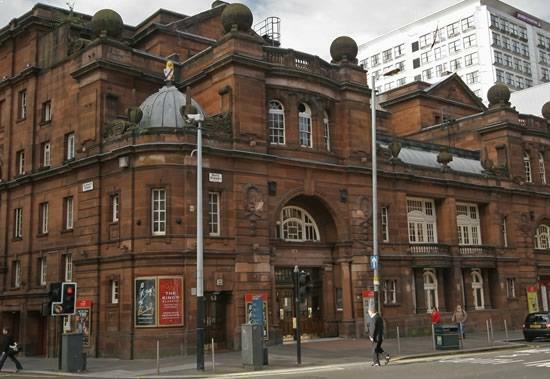 This elegant Edwardian theatre lies at the heart of Glasgow’s community and is now opened throughout the year with a full programme of events. Now managed and owned by the Ambassadors Theatre Group, it is one of the country's foremost theatres and stages some of the most successful and innovative productions in Britain and international theatre arena.